Communities have been working together to address barriers to walking and bicycling to school and have made remarkable achievements. In 2013, the National Center for Safe Routes to School Trends in Walking and Bicycling to School from 2007 to 2012, announced that the percentage of students who walked and bicycle to school had increased from 12.4% to 15.7% in the morning; and from 15.8% to 19.7% in the afternoon. Sometimes individual stories paint the picture better than statistics and truly illustrate the power of collaboration and the positive results that communities can achieve. At Rosewood Elementary School in Columbia, SC , a parent (who was also a teacher at the school) noticed on her morning walks to school with her daughter that cars were driving too fast in front of the school. Almost weekly, the teacher saw cars running the red light at one of the school’s main intersections. Wanting to slow down traffic, the parent sent out a request for ideas to parents and faculty members. She learned of the South Carolina SRTS program, applied and received funding from the SC Department of Transportation. She then formed a committee including parents, teachers, school administration and the school nurse to form a plan and conduct activities. 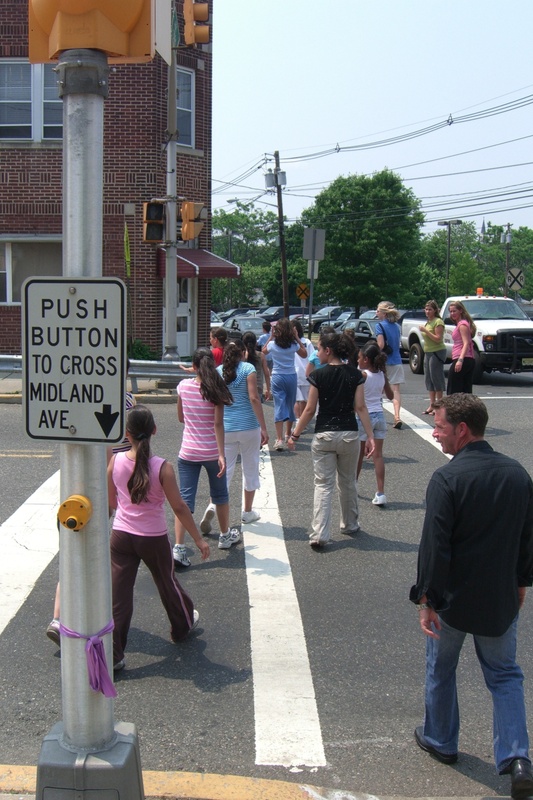 Rosewood now offers pedestrian and bicycle safety messages to both parents and students via take home flyers and PA announcements, encouragement programs such as Walk to school day and a Walking Fridays (a Walking School Bus program), and has stepped up law enforcement during school arrival and dismissal. 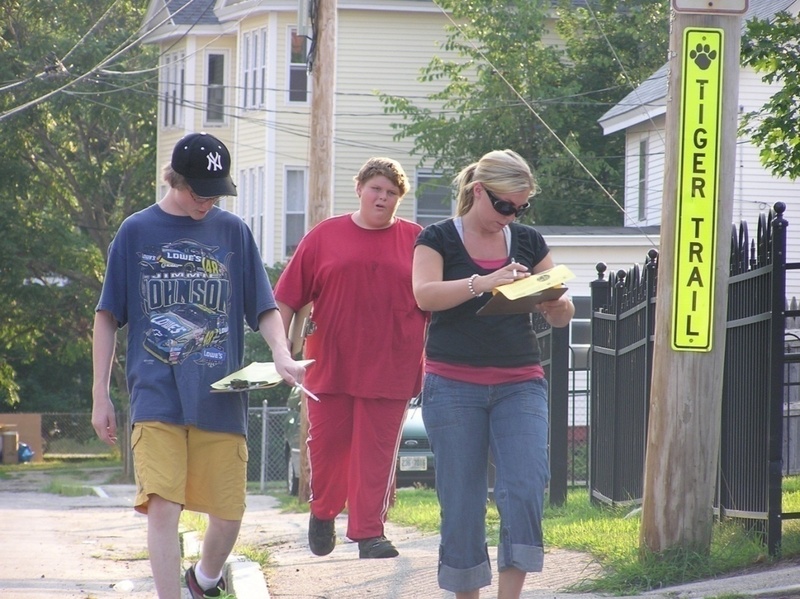 With support from a DOT traffic engineer, the committee also developed a plan to improve sidewalks, crosswalks, and signage, and researched ways to improve conflicts during school pick up and drop off. RESULTS: Based on parent reports, the law enforcement patrols and the media attention surrounding the program have resulted in slowed traffic around the school. Parents also report that while driving, they are more aware of pedestrians and bicyclists. 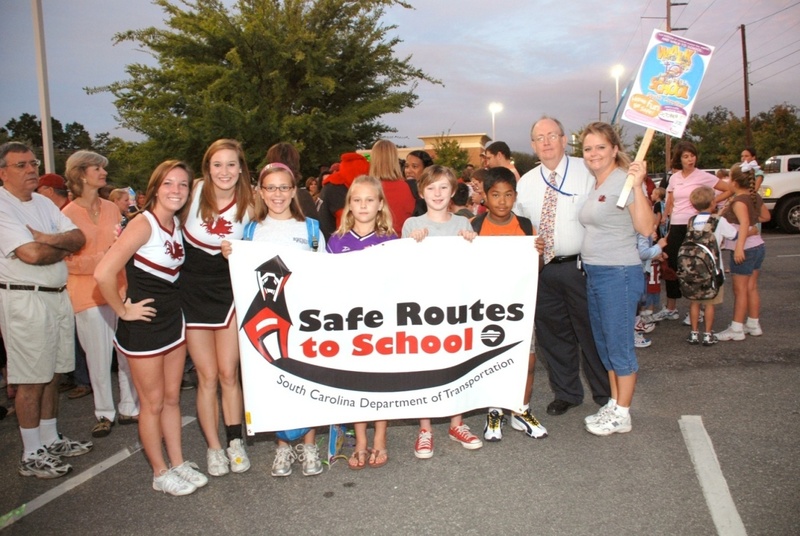 For more details visit http://www.saferoutesinfo.org/about-us/newsroom/our-newsletter/article/safe-routes-snapshots-columbia-south-carolina-%E2%80%94-comprehensi. After learning about safe routes to school through the Mayor’s Wellness Campaign, the Garfield Health Department in Garfield, NJ , established a comprehensive SRTS program that improved the quality of life for both students and community members. A SRTS committee was formed and included employees of the Garfield Health Department, Active Living Resource Center, community residents, teachers, principals and law enforcement officers. They helped implement SRTS at eight elementary and middle schools. The program includes a SRTS curriculum focusing on pedestrian and bicycle safety and encouraging physical activity, and student feedback on neighborhood walking conditions. Children were given digital cameras to document the conditions on their walk to and from school. These pictures were then given to city engineers to help them understand and prioritize infrastructure improvements. Based on information the students provided, the city created route maps and distributed them to all students. RESULTS: As a result of their program, safety education has been integrated into the classroom, children are excited about walking and bicycling to school, and the process inspired the community to pursue funding to build a new family exercise path. In 2007, Garfield received funding from the NY Giants football team and United Way’s Hometown Huddle to construct the path. For more details, visit http://www.saferoutesinfo.org/program-tools/success-stories/garfield-new-jersey-residents-benefit-healthy-living-campaign. Farmington, NH , is a close-knit rural community with almost 7,000 residents. Two schools in town, Valley View Community School and Henry Wilson Memorial School serve approximately 975 students in kindergarten through eighth grade. Some of the parents expressed concern that many of the neighborhoods did not have the necessary sidewalks and crosswalks to provide children with safe walking and bicycling routes to school. In response to these concerns, law enforcement officers and school personnel designed a SRTS program. They received a grant from the State of New Hampshire in 2004 and constructed the “Tiger Trail,” a path marked with paw prints and signs that connects the neighborhoods to elementary schools. Additional program features include a school resource officer who provides safety education at school assemblies, a walking school bus, and annual student travel tallies and parent surveys. RESULTS: Since the construction of the Tiger Trail, program leaders have noticed increasing numbers of children walking to school. Parents enjoy the trail because it addresses many of their safety concerns while allowing the children the opportunity to be outside. For more details visit http://www.saferoutesinfo.org/program-tools/success-stories/farmington-new-hampshire-farmington-srts-program. 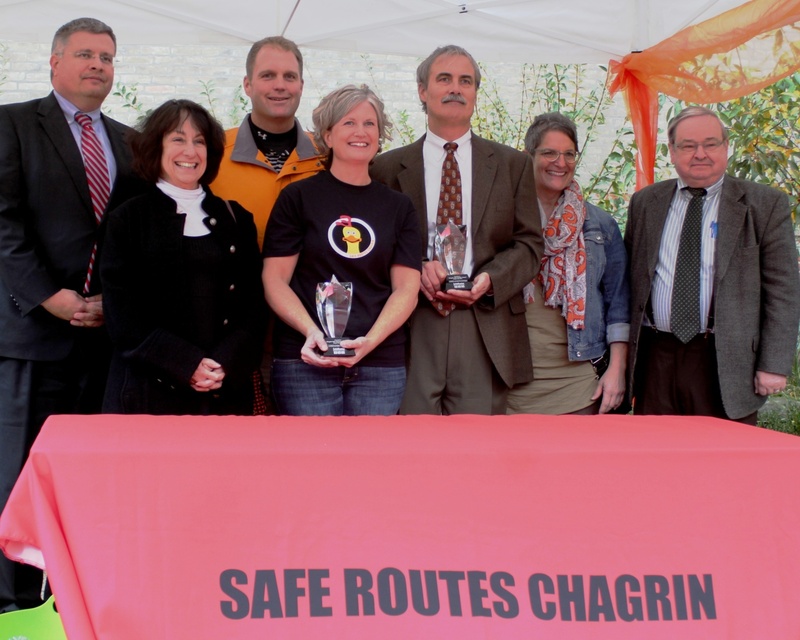 Chagrin Falls, Ohio , was the National Center for Safe Routes to School’s 2012 Oberstar SRTS Award winner. Chagrin Falls is a village of about 4,000 residents located 17 miles southeast of Cleveland and includes an elementary school (grades K-3), an intermediate school (grades 4-6), a middle school (grades 7-8, and a high school. Before the Safe Routes Chagrin program began in 2009, although nearly all of the intermediate school students lived within two miles of the school, only 17 percent walked or biked to school. Parents were worried about sidewalk gaps, street crossings, and personal safety. To address these concerns, the program did several things including sidewalk and pathway construction both on and off the school campus, improved policies about snow removal and driver behavior, and used the local community theater to assist with safety education. RESULTS: By engaging the entire community to address safety concerns and provide encouragement and education to students, Safe Routes Chagrin has increased the number of children who regularly walk and bicycle to school from 17 percent to 26 percent. For more details visit http://www.saferoutesinfo.org/program-tools/success-stories/chagrin-falls-ohio-comprehensive-safe-routes-school-program-built-arou.